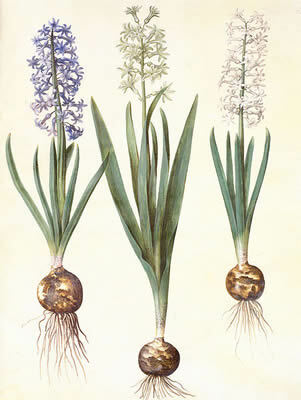 Wild Hyacinth Side Effects: The fresh bulbs are poisonous, any use made of this plant is always when dried. 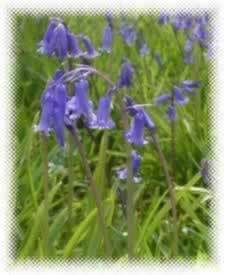 Flowers/Fruit/Seeds:Flower stem rises from the bulb and the pendulous, bluesih-purple "bluebell" flowers drape from it in a long, curving line. Parts used: Bulb, starchy juice from the whole plant found uses as an early glue. Woodlands :So abundant in English woods and pastures, whilst so widely known, and popular with young and old, as to need no description. Hyacinth petals are marked in general with dark spots, resembling in their arrangement the Greek word AI, alas! because a youth, beloved by Apollo, and killed by an ill-wind, was changed into this flower. But the wild Hyacinth bears no such character on its petals, and is therefore called "non-scriptus." The graceful curl of the petals, not their dark violet colour, has suggested to the poets "hyacinthine locks." The roots, dried and powdered, are balsamic, having some styptic properties which have not been fully investigated. W. T. Fernie ,M.D. (1897). "Herbal Simples Approved For Modern Uses Of Cure"
When dried and powdered, the root as a styptic is of special virtue to cure the whites of women:(Leukorrhea) in doses of not more than three grains at a time. 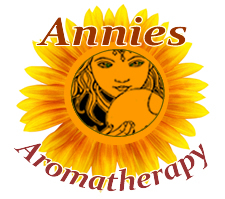 "There is hardly," says Sir John Hill,(1796) "a more powerful remedy."